Greetings from Moose Pond! I am writing this note while sitting on our dock on the west shore of the middle basin having just finished my morning row. Just about every weekend day from May to October, I hop in my skull and row up and down the lake in one direction or the other depending on the wind direction. When I am out on the water, I am continuously amazed at the beauty of our special lake. I gaze at the mountain and often think of it as our protector for many reasons including the fact that it shields us from westerly winds. Before I talk about our plans for next year, I would first like to thank three extremely active board members who retired from the board at the end of this summer. David Ehrman was the first MPA president. His leadership and dedication over the last 10 years was more than impressive. Steve Cavicchi, managed our database, unfailingly kept our mailing and membership lists up to date, picked up the mail, deposited checks and much more. Brian Thomas was our very dedicated CBI (Courtesy Boat/Milfoil Inspectors) coordinator and webmaster. 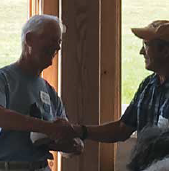 The Moose Pond Association is indebted to these fine gentlemen and all the wonderful work they have done for us over the years. The MPA board has some ambitious plans and challenges in the coming year. We have a committee working on a new website. We could really use a volunteer to manage it on an ongoing basis. The new site will be very user-friendly and can be managed remotely. Board member Bill Muir has kindly agreed to be the new CBI coordinator. We want to start a LakeSmart program on Moose Pond to encourage responsible property management by our friends and neighbors. We need a couple of volunteers to work with Roy Lambert, the LEA LakeSmart coordinator, to educate waterfront land owners to become more lake water conscious/run-off aware. As you know, besides invasive species, phosphorus in our lake is the next biggest threat to its overall quality. Roy came over to my house this past summer to certify us as a LakeSmart property. Finally, we could also use a local volunteer to help with database/mailing list management and picking up the mail from the Bridgton Post Office. Please contact me at Mark@patco.com if interested. We are also interested in recruiting more MPA board members. We are well represented from the middle basin — but would gladly accept more. We need a couple more representatives from the north and south basins. Most of the work of the board is done remotely through e-mail. We have a spring board meeting in May and a short meeting after the annual meeting in August. It does not require a lot of time. The more board members we have the more we can distribute the important work we are doing. Again, contact me if interested. To close, I want to remind us all about the variable leaf milfoil outbreak on Long Lake this summer. We all need to be diligent in protecting Moose Pond from such a tragedy. The cost of mitigation can be expensive. The effect on the quality of the shorefronts infested with invasive plant life is shocking. The effects of waterfront property values with invasive plants on their shores is well documented. Please continue your support of our association. If you can, step up your donation level so that we can do even more. Enlist your friends and neighbors to support us. Become involved! The quality and beauty of our special lake depends on it. Have a great fall. I will see you on the lake.